The French Bulldog has become one of the top 10 breeds in the U.S. Avoid Non-American Kennel Club standard French Bulldogs, from poor quality breeders. "Rare" colors are produced by combining other breeds with French Bulldogs. Not only are they not purebred they are poor quality and a sad interpretations of the breed. People calling themselve breeders, are cashing in on uninformed individuals offering "Rare" colors with extraodinary price tags. There are awful stories of sick, blind and deaf Frenchies kept in inhuman conditions. Don't be taken in by "breeders" or importers, of puppy mill pups foreign and domestic, or that are producers of obscured genetics. Identify risky and unsafe "breeders" having websites with credit card or Paypal icons, having multiple pups available, advertising "Rare" colors. Also those requesting deposts on unborn pups or that are not registered with the American Kennel Club (AKC). Be expected to visit the pups and parents, if possible and check references. DO YOU WANT A FRENCH BULLDOG? Take your time, know what you want and be open to the RIGHT puppy or mature French Bullodg. Don't be stuck on a color. Research the breeder and make sure to ask the right questions. After all, you are parparing to love and take care of a new little friend, for many years to come. Timing is important. 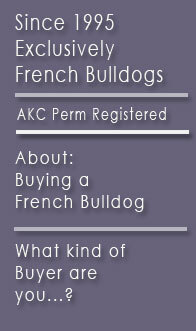 A private and dedicated breeder of in home, hand raised, beautiful French Bulldogs located in southern California. Producer of several generations of AKC standard, show champions. 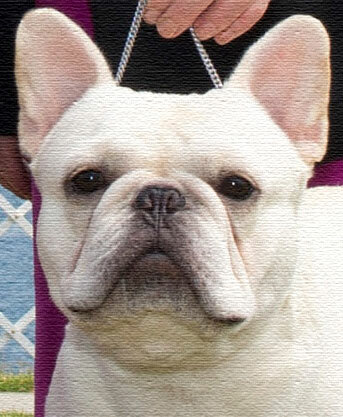 Bred by exhibitor multi best in specialty show mutli group winning and nationally top ranked French Bulldogs in the U.S.
Allusion stives to better the breed for health, soundness and quality. A family of generations based on classic, traditional pedigrees.